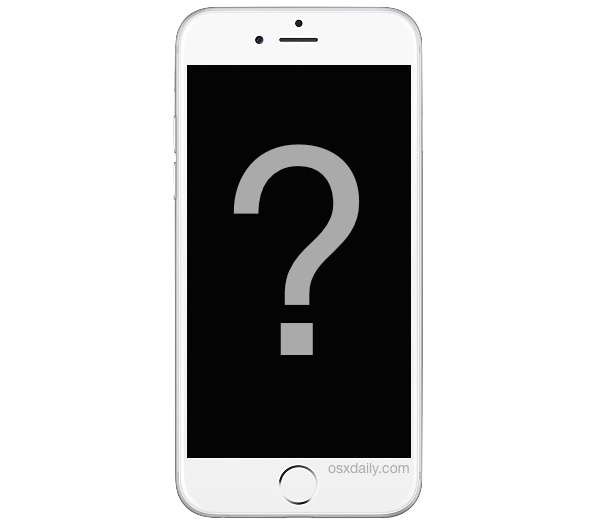 Knowing what network an iPhone uses can be important for trying to repurpose an old device, buying a used iPhone, or simply to determine if a particular iPhone will work on a network of choice. While the iPhones top status bar will show the carrier name of an active cellular network, if the device isn’t activated or doesn’t have a SIM card, it won’t display anything other than “No Service” in the status bar. That doesn’t mean you can’t find out what network the device is locked to or last used though. Even if an iPhone has no service, no SIM card, and no activation on a CDMA network, you can still find out what cell carrier network the device was recently using or attached to by going to the device Settings. 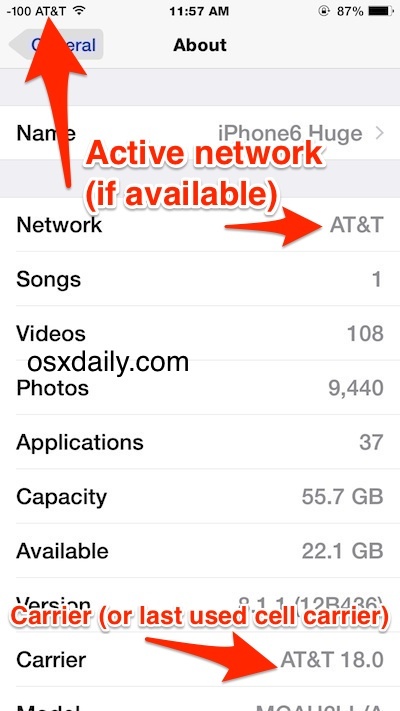 In the example screenshot, the Carrier of this particular iPhone shows AT&T (followed by the carrier software version) – this is the last network that the iPhone used, was bought with, and wants to join. So you may be wondering about phones that are bought unlocked, and maybe about an iPhone that has been unlocked through AT&T (like the phone in this screenshot), in these cases, the “Carrier” setting will show the last cellular carrier network that was joined or used. In other words, if you have an unlocked iPhone that was bought off contract at full price, and you mostly recently used a T-Mobile SIM, it would show that. Or if the iPhone was mostly recently using Verizon or Sprint, it would show that. This all matters for who and what can use a particular iPhone on a given network, though it’s important to point out that unlocking an iPhone makes the preferred cellular carrier irrelevant, if it’s an option. You can always check to see if an iPhone is unlocked by trying to use a different provider SIM card, if it works immediately, you’ll know the device is unlocked. Aside from casual use and figuring out what network an iPhone can use, this can also be helpful for using ipcc files correctly. For those interested in gathering even more information an iPhone carrier (an active one, anyway), entering into Field Test Mode settings has some much more technical details available, far beyond just telling you which cell provider a device is actively using. Though I’ve never heard of a carrier called “Carrier” in Japan. I bought it from someone a couple weeks ago, but he sad it was locked and he never gave me a sim card. My 1st iPhone I bought it cause i thought the unlocking was a simple task. but I guess not. He did say later on in an email that it was from AU company which is one of the japanese companies I know of. I was wondering if you knew what I could do to unlock it? Your help would be greatly appreciated!! Have a good day! Rsim 9, Rsim 10, thats the only way thst u can use ur iphone. I have a few iphone I got in bulk but all are factory reset so I can not access the settings to find out what carrier they are for. Is there any other way to find out? My iphone was last used by a different carrier called Airtel but thats not the carrier it was locked to. Carrier only shows the last sim card used in that iphone pls help me solve this i wanna know the carrier its locked to. Hello Priya, for you, it is an article called “How to Check What Cellular Carrier Network an iPhone Uses (or Used)” this is what I used and it worked for me. I have unlocked iPhone so it works with all SIM cards, yours maybe too? I can’t even get to general setting because SIM card isn’t right. So What Your Saying Is , If It Has A Carrier In The “Carrier” Slot , Then It’s Locked To That Carrier? This may be an AT&T iPhone 4. I just bought an iPhone off offer up, I went to iTunes to set the phone up but it won’t let me it just says insert SIM card,won’t let me proceed to register or anything, how do I find the provider if I can’t access info on phone? If there is a SIM card in it and you still cannot access the settings, it means the phone is still locked. I bought a iphone 5c from a person who says it was an unlocked phone but apparently it wasn’t cause I couldnt connect to the provider of my choice,but now that I had a sprint sim card in the phone it now says sprint for the carrier,so how can I find out which network this phone belongs to. I bought a Iphone 5s it is suppose to be unlocked and a Verizon carrier. I went to Verizon to have a sims card and service put on the phone. When Verizon put the IMEI number in the system my phone would not pull up. In the About in my phone it shows it’s a Verizon carrier. What do I do? You need to run an iPhone carrier checker to find out what network your iPhone is locked to. hi i have an iphone 5s and i dont know the carrier when i check the info in settings it indicate the details of a sim card am trying to use my imei is 013888008124409. Can anyone check which carrier my phone is locked too. What if my iPhone screen doesn’t work am I still able to find out what carrier my phone is locked to without going to an Apple store or anything? I try different sim for the sim activation but i didnt find the correct carrier can some one could help please is iphone 5s – 013845008846100 thanks advance ! We have an Iphone 5 with no sim card. in the settings for network and carrier it says “not availible. Is there somewhere else to look? Hello I have iPhone6s icloud and carrier both locked can you help me please? I have this iPhone that I brought from my friend few days from now. When I started using it with my SIM card, I found out that I cannot send text with numbers that start with +639****** but I can text numbers that start 09****. It’s hard for me because I can’t reply automatically I have to retype the number into 09****., can you help me please? can you please tell me what carrier this iphone 7 is from? This info is wrong – – the phone will always show the carrier for the last SIM card that was inserted. That does NOT mean the phone is unlocked for that carrier. This information is correct, Andy is wrong. An incompatible SIM card will not work on a iPhone. You must use an unlocked phone with a compatible cellular SIM card that is activated. The iPhone is telling you what to do, try to put in a SIM card then connect it to iTunes. The Sim card must be active. Take it to an Apple Store, they can help you through this if the process is buggy. Apple is good at solving these problems.